The Bobcat T450 Compact Track Loader is great for manoeuvring around tight work sites and it excels at tasks with mid-range working heights, such as backfilling, unloading flatbed trucks or dumping over walls. Many of our customers choose the Bobcat T450 for it has unmatched power to push through the most demanding of jobs. It has industry leading breakout force, rated operating capacities, faster cycle times and quicker turns, making it a highly versatile, multi-purpose site vehicle. Furthermore, as it is compact, it’s easy to transfer between sites as it can be loaded onto a trailer or flatbed truck. 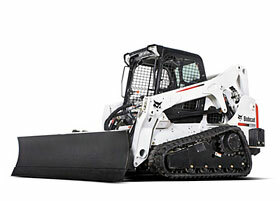 We have a choice skid steer loaders from Bobcat. Please see our Skid Steer Hire page for more information. The Bobcat T450 is a very compact tracked loader it can get around site easily and go where others can’t. It has reinforced arms and is compatible with over 90 attachments, making this compact loader an invaluable site vehicle capable of a multitude of loading, construction and demolition tasks. As it is fitted with tracks the loader is light across the ground and has more stability, which is ideal for working on uneven terrain or inclines. With a travel speed of 11km/hr, or 17km/hr for the two speed model, and a standard bucket width of 1397mm, it can transfer material across site quickly and efficiently. It’s height lift capacity of 2781mm means it can also reach and load materials for a wide variety of tasks. As the Bobcat T450 is very compact for a tracked loader, it means it can get around site easily and go where others can’t. As a tracked loader it has more stability when working on uneven terrain or inclines and the two speed model can reach speeds of 17km/hr. With a height lift capacity of 2781mm and a bucket width of 1397mm this tracked loader can transfer material across site quickly and efficiently. The Bobcat T450 Tracked Loader is very agile and its cab is operator-friendly with easy access, excellent visibility, low noise and vibrations. There is an instrument panel with additional functionalities and diagnostic capabilities. The automatic ride control creates a smoother ride, improving operator comfort, reducing material spillage and allowing you to travel at faster speeds across site. We have a fleet of Bobcat Compact Track Loaders available for long and short term contract hire. Contact our Hire Desk team for more information on the Bobcat T450 and the choice of attachments available with your track loader hire. As always, our equipment has regular servicing and thorough checks before being sent out on hire, so your loader will arrive on site in excellent condition. We can offer a delivery or collection service from our depot close to the M25 in North London. Delivery can easily be made to sites in London, Hertfordshire, Essex, Kent and even nationwide. Alternatively we can provide a trailer so you can collect your loader from us.